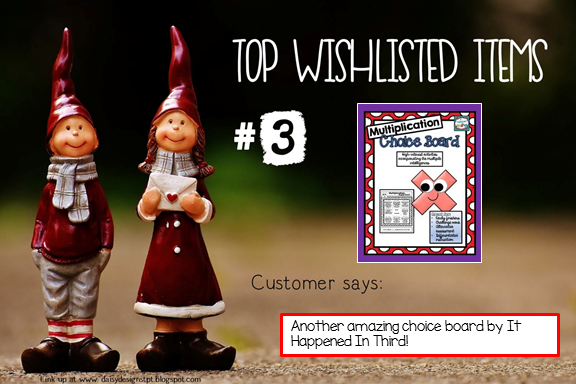 Top 3 Wishlisted Items from It Happened in 3rd! If you've been on Instagram or Facebook this weekend, you know there's a big ol' TPT sale happening this week! On Monday and Tuesday, you can get up to 28% off resources from your favorite teacher-sellers by using the code CYBER2016 at checkout. This is the time to stock up on those resources you've been eyeing as we get ready to power through the second half of the school year! 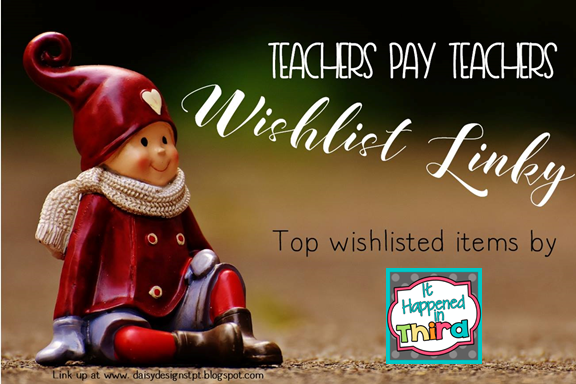 I'm linking up with Daisy Designs to share with you the top 3 wishlisted items at It Happened in 3rd. It doesn't surprise me in the slightest that all 3 resources are choice boards or menus! Teachers all around the country are using the power of choice to keep their students motivated and engaged. Read on to see what teachers have been saying about how they use these resources to save them time and make their students happy! My Fiction and Nonfiction Homework Menus are incredibly easy to implement and grade. Teachers love the meaningful practice this resource provides. Parents love that their children can work on this independently, using the examples provided and the rubric to help them. Students love that there's a variety of options, so they don't get bored doing the same thing over and over. Check out this post to read more about how to use these menus in your classroom! Best news yet...I'm keeping this resource at the low price of $1 while I work on updating it. This means you can grab these menus for almost nothing during the sale! 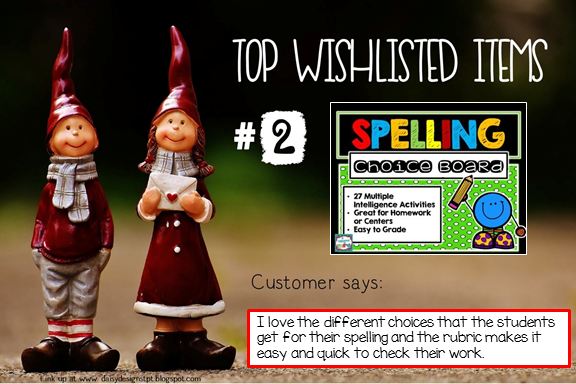 My Spelling Choice Board is another great option for homework or centers. After students complete 1 of the Must Do activities, they have 24 different options, all based on the Multiple Intelligences. The rubric makes grading a snap! Also included is a page of directions that could be glued right into a notebook for students to refer to. Bargain alert! This choice board is also included in my Choice Board Growing Bundle, in which you receive every choice board in my store for an incredible low price. If you purchase the bundle during the sale, you will receive all of the choice boards I upload from now on FOR FREE. Make sure to check it out! Finally, my Multiplication Choice Board is a huge it for teachers looking for an easy way to differentiate. There are 8 different activities based on the Multiple Intelligences. You can choose how many to assign, and select a due date when the activities need to be turned in. This is a great option for your early finishers or your gifted/high achieving students. You can also use this choice board as an alternative assessment option! Looking for more items to fill up your cart? Be sure to head back to Daisy Designs and check out all the other links. Happy Shopping!